Delores Barksdale Chandler, MA, OTR was a founding member of the New York State Black Occupational Therapy Caucus and served as its first Chairperson from 1975 through 1983. She received a Bachelor of Science degree in occupational Therapy in 1961 and a Master of Arts in 1966 from New York University. Ms. Chandler was very active in the field of mental health. She held the title of Chief Occupational Therapist at Harlem Hospital Center from 1980 through 1982. Ms. Chandler served as a role model for many Black Therapist and Students in the field of Occupational Therapy. She was active in community outreach programs for Occupational Therapists and Occupational Therapy Assistants. The Delores B. Chandler Scholarship was established to commemorate her commitment to the profession and the community. The Delores B. Chandler Scholarship is awarded annually to deserving Black Occupational Therapy students at the annual Kwanzaa Celebration. To be eligible, the Occupational Therapy student and the Occupational Therapy Assistant student must have completed 2 semesters of Occupational Therapy and the Occupational Therapy Assistant program with a minimum GPA of 3.0 and have demonstrated community service. Please click the link below for an application form or contact the NYSBOTC for further information. The Celeste Pasley Merit Award will be awarded every two (2) years to a Black Occupational Therapy practitioner (OTR or COTA) who has demonstrated significant contributions to the human condition via: Clinical Experience, Community Involvement, Research, Education or Mentorship . Nominations for the Celeste Pasley Merit Award will be accepted Dec-May 1st of the award year. The recipient will receive a plaque and certificate from the NYSBOTC. 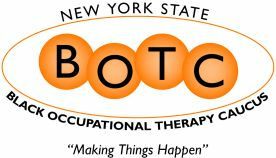 Nominations may be made by any individual, institution, or organization; however, the nominee must be a Black Occupational Therapy practitioner living and working in NYS. Please contact the NYSBOTC for nomination form.